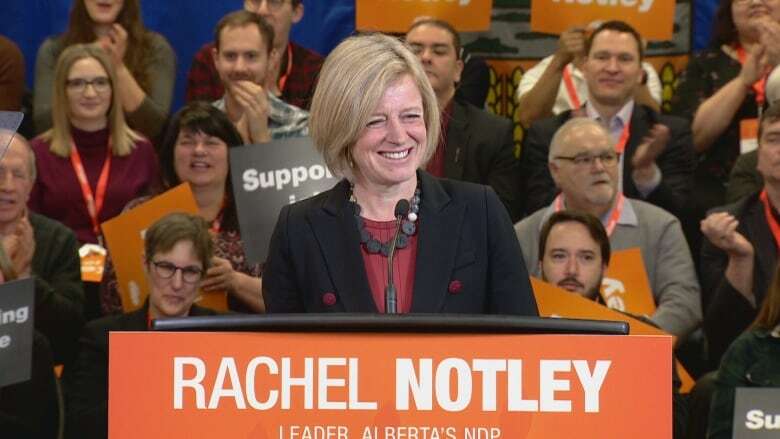 Alberta Premier Rachel Notley gave a campaign-style speech to a room of cheering supporters in Edmonton on Saturday, but said she has no plans to call an early election. "We've always been pretty clear that we're going to follow the law around the general timing of the election," Notley told reporters after the speech. With the provincial election just over a year away, Notley told the crowd the province faces the question of whether to return to boom and bust policies of the past or build an economy to last. She said the NDP's response to the economic downturn has been to make life more affordable for Albertans by cutting school fees, capping electricity rates, freezing tuition and piloting a $25-a-day childcare program. Notley's speech comes a week before the Alberta legislature resumes its spring session on March 8. She took numerous jabs at United Conservative Party leader Jason Kenney, blasting the party for its policies and a tax plan she said only benefits the top one per cent of Albertans. "Jason, the 1990s are calling and they want their ridiculous ideas back," Notley said. Through chants of "NDP," Notley talked about moving forward on climate action and keeping pressure on the B.C. government to cooperate with the Trans Mountain pipeline expansion. Notley's NDP government imposed a ban on B.C. wine last month, spurred after B.C. called for further review of the risk of oil spill from the pipeline expansion. It proposed a temporary ban on increased exports of bitumen from Alberta in the meanwhile. The ban was lifted after two weeks, when B.C. Premier John Horgan said his government would turn to the courts on the matter. Notley said her government will not let up on the issue. She said she is keeping a "very close eye" on what's happening in B.C. and that she will take action if there are any further delays. "If we let one province overturn a decision made in the national interest, then the whole country loses," she said Saturday. "Together, we're going to keep the pressure on. We're going to move forward on climate action, we're going to move forward on building an economy that works for everyone, and we are going to get this pipeline built."